This Christmas classic "Here Comes Santa Claus" was written by Gene Autry and Oakley Haldeman in 1947 and it became instantly popular. How could it not have? 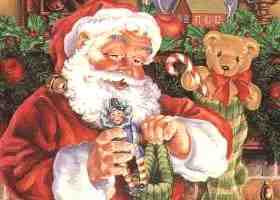 It includes all the elements that children associate with Christmas. The song has Santa Claus, reindeer, hanging stockings, a bag of toys and a line at the end that reminds children they should be sleeping when Santa comes. It's also a quick, short song that kids will have no trouble learning and remembering the words to. Which means... they will learn it and will typically sing it loudly and with gusto! To add a touch more fun when teaching this song, include a countdown to Christmas craft. Kids sometimes have a tough time understanding how long of a wait it is for Christmas. Especially since the stores are decorated for Christmas long-long-long before the actual day. Listening to and singing Christmas songs puts everyone in a great holiday mood. Start the sing-a-long. To make a paper chain, simply use construction paper cut in strips (stapled or glued) to form a chain of 24 links. We make these at the end of November using alternating red and green links. Connect the chain to a topper of your choice. Anything Christmas-ey will do. Add a loop at the top for hanging. The child takes the chain home, and starting December 1st, the child rips off one link per day. When the links are gone, Christmas is the next day. It's fun when the kids come in the morning and can announce how many days are left. My own son, when he was young, ripped off a bunch of links in one day thinking that would make Christmas come faster. He was fairly sad to find out that it didn't work that way. Most children will, however, adhere to the one link a day rule. OR… hop on over to the FREE PRINTABLES section to make planning activities for your daycare practically effortless.